I have been finding some decent deals recently on GTX295's, I have a few that I am going to be installing over the next few weeks, but it being summer here now, and the temps getting into the 90's, they are showing their true colors in terms of power draw and heat output. It wouldn't be a biggie in, say, January, but in July/August, well, it isn't appreciated as much. I am wondering what 4/5/6 series card would provide about the same in terms of performance, while drawing less power and generating less heat. I know it would most likely be more expensive than collecting 295's, but obviously it's performance has been surpassed but the latest cards, by a great deal. I am not looking at a 690, thank you, but I would have to think that there are some 500 series cards that could equal it for somewhere near the same price as they are selling the 295's for. What has been your experience, folks? Message 1243693 - Posted: 9 Jun 2012, 3:38:14 UTC - in response to Message 1243692. Where are you finding 295s???? Talking about burned out stuff? Anyway, to answer your question. I dunno about current stuff, but a GTX590 will closely replace 2 GTX295s. Message 1243718 - Posted: 9 Jun 2012, 3:49:19 UTC - in response to Message 1243699. So a GTX680 would be even faster, while using even less power. The GTX680 uses less power than a GTX560Ti. Message 1243743 - Posted: 9 Jun 2012, 3:59:45 UTC - in response to Message 1243718. The 690 would be the top dog. Or kitty. If I could pony up the funds to convert all I have to 690s......LOL. Less power overall, less heat, more kibbles. You can get refurbished GTX 460 for 100-110 dollars. Or new GTX 460 for 110 dollars. A refurbished GTX 560 will cost you 150-160 dollars. I don't think I would bother with anything from 2xx generation. Message 1243929 - Posted: 9 Jun 2012, 12:22:30 UTC - in response to Message 1243693. Message 1243931 - Posted: 9 Jun 2012, 12:31:02 UTC - in response to Message 1243823. I have 2 GTX560Ti's in my multi-GPU rig, can't tell yet if they are doing any better in RAC than the 295. As for price, I paid about 200 new for them (after rebate), so they are still a little more expensive, but I hadn't looked used. Is there a way I can tell in my stats how each card in a rig is doing? As I mentioned in one of my other threads, I have yet to get my RAC with 2 560's, a GTX260 and a GTX285 back up to what it was before I upgraded the client and vid drivers when I was just running 4 GTC260's. I've been patiently waiting got it to get back to 58k. Are there better/different versions of the 500 series that are in the same $150ish price range, that work as well or better than the 295? And do you have any RAC numbers to compare the different cards, or know where someone could find that info? Thanks! As a quick and interesting aside, I have BOINC set up on my inlaws computer, I had upgraded it to a Core 2 Duo CPU E4600 and slapped in my old GeForce 8800 GT card. It hasn't been upgraded to more current versions of BOINC and vid drivers, and it's just sitting there unused most of the time other than them doing occasional emails and web browsing. That machine has a consistent RAC of about 10k, while my multi-GPU machine with the i7-950 and the video cards mentioned above is currently only pulling down 45k. The i7 rig is running 16 tasks concurrently, but still only 4.5x the RAC. Thought it was an interesting tidbit of info. I did a comparision using single precision GFLOPS. That's not directly RAC numbers, but it's a good guideline to compare cards against each other. 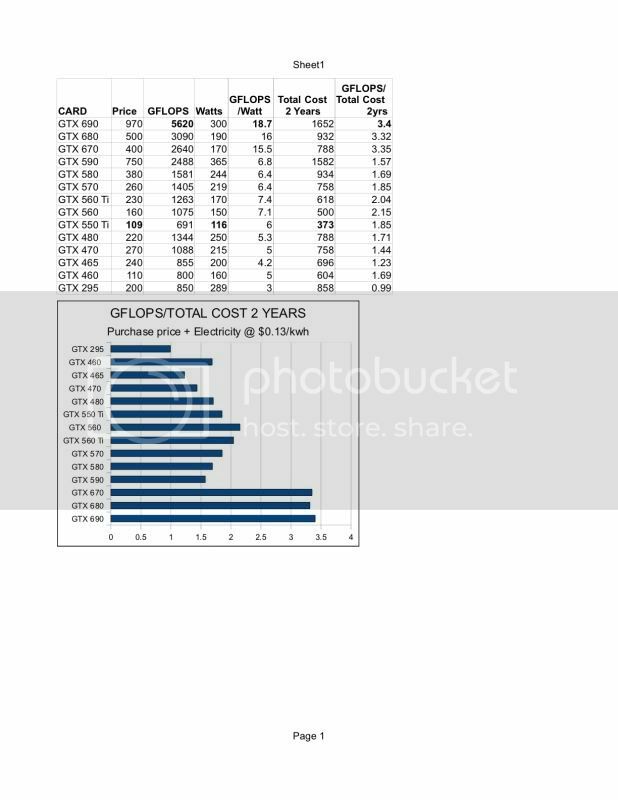 Total cost = Purchase price + Electricity @ $0.13/kwh for 2 years. This does not include air conditioning which would add to your bill substantially. You can see that buying a 295 and running it continually for 2 years is going to cost you roughly $850. For less money you can run a 670 that has triple the performance. In the graph you can see the 6xx cards are far and away the best value. Message 1244089 - Posted: 9 Jun 2012, 20:06:22 UTC - in response to Message 1244086. Yeah, OK. Like I did not know the facts....LOL. Will you front me the funds to do the conversion on my top rig? Promise to buy you a hamburger on Friday. I have the last pair of 295s running in the top 20 rigs. Except for vypir.....who shows 4? running in a single rig. That is quite a feat. Message 1244137 - Posted: 9 Jun 2012, 22:13:26 UTC - in response to Message 1244089. 4 on one machine, huh, impressive. How many GPU's does one instance of BOINC support? At least 8, obviously. Wonder if that is the limit? You want a serious response, or just BS? Twenty GPUs is not too many......LOL. Message 1244214 - Posted: 10 Jun 2012, 2:32:02 UTC - in response to Message 1244182. Of course I want a serious response! :-) I have no idea if there's a limitation to the number of GPU's one machine can support in BOINC. I suppose if you use the Hydro version of the 295, and install 8 of them into a board like my SR-2 or 4-way SLI, you could technically have up to 16. That is of course if you have the money, and if the software would support it. Is there a limit? Imagine 8 Hydros working in one machine. Man! A 2000+ watt machine easy. Is there a limit? Imagine 8 Hydros working in one machine. Man! A 2000+ watt machine easy. Seems I've heard This Story Before. From a Lonely Voice Deep In The Desert. Message 1244220 - Posted: 10 Jun 2012, 2:56:50 UTC - in response to Message 1244214. Sorry, my sarcasm was not aimed correctly. I seem to recall that there was a 8 GPU limit or something like that which Boinc would recognize. What you try to hang off of it is another matter. Message 1244237 - Posted: 10 Jun 2012, 3:41:16 UTC - in response to Message 1244220. Message 1244238 - Posted: 10 Jun 2012, 3:44:55 UTC - in response to Message 1244237. Just take my statement seriously that there IS a point of diminishing returns. You can't just stuff any unlimited number of cards in a rig and expect the output to increase exponentially. Part of the reason the kitties do so well with their limited resources is because they are spread out amongst 9 rigs. They have enough CPUs to buck up the GPUs. I'd build a bunch of 2 card rigs with 690s. But no more than 2 per rig. And I'll beat your 8 card rig all the way down. I do know this game pretty well by now. No diss to him, but Vyper has 4 295s struggling away in his rig to hit 100k RAC. I have 2 making 77K. Why is he not at 150K? Put this monster of parts together, just for fun ! !